What Day Of The Week Is September 21? 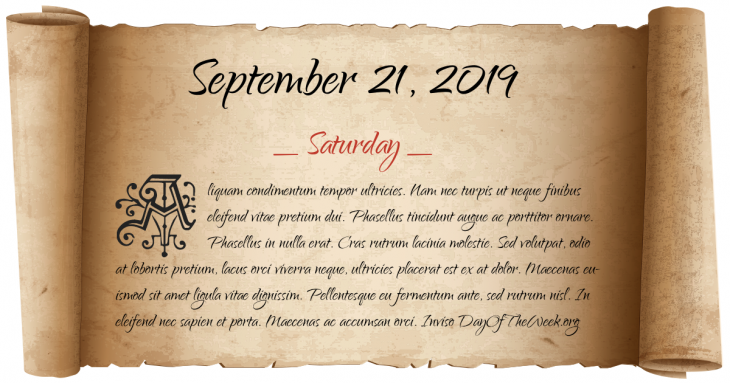 September 21, 2019 is the 264th day of the year 2019 in the Gregorian calendar. There are 101 days remaining until the end of the year. The day of the week is Saturday. In the Second Opium War, an Anglo-French force defeats Chinese troops at the Battle of Palikao. The B-29 Superfortress makes its maiden flight. Gambia, Maldives and Singapore are admitted as members of the United Nations. Who were born on September 21?